Drone enthusiasts will be certainly in confusion with the latest release of DJI Mavic Pro Drone. So, everyone is busy in analyzing the features and specifications of Mavic pro. Based on the review unit I am presenting this review. Previously as a drone lover, I have used many drones like DJI Phantom 4, Yunnec Typhoon and Parrot Disco. But the DJI MavicPro is a bit different from them. Let us see the specialty and uniqueness of this drone. On Considering all the DJI’s drones, Phantom 3 and Phantom 4 are very easy to use, and they are Ready to Fly drones. I have even flown the DJI Mavic Pro, and there’s nothing hard or complicated about using it. It is extremely easy, flexible and portable. Mavic Pro has two cameras for 3D vision positioning and ultrasonic sensors for certain height holding and positioning. It also has dual gyro sensors, accelerometers, and compasses for more precise redundancy and data. 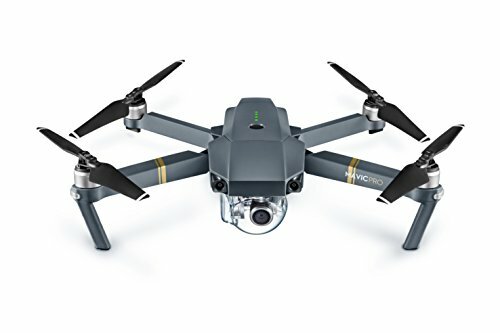 We can order this DJI Mavic Pro drone from amazon.com. Amazon ships the unit during the first week of November, and you would receive your Mavic around the 10th of the November. Buy this outstanding drone from Amazon and experience the incredible flying experience. DJI Mavic Pro has some advanced features when compared to the DJI Phantom series. Mavic Pro has some features like the front facing obstacle detection, and it has flight modes like tap to fly and return to home. It has dual cameras; you could capture ground footage as well as aerial footage at the same time. DJI Mavic Pro is a Ready to Fly drone, and no installations are required. The unique feature of this drone is portability. The DJI Mavic Pro folds down as small as a water bottle and enables you to carry it to anywhere you like. It has a high-performance computing cores and transmission system with a range of 4.3 miles. It offers four vision sensors, and a 4K stabilized camera by a 3-axis gimbal. Using Flight Autonomy technology, it can identify the obstacles away from 15m. So that it can fly at a speed of 22 miles per hour. DJI is a Chinese company established in 2006, and it is a leading manufacturer of drones. The DJI company provides its services in different countries. The headquarters of DJI are located in Shenzhen which is widely considered as China’s Silicon Valley. Starting as a small office in 2006 it became a giant global workforce. The company has worldwide branches in U.S, Netherlands, Japan, Germany, Beijing and Hong Kong. The DJI company builds on the ethos of “form follows function.” The DJI systematically releases the latest drones with updated technology. DJI says you should be able to fly the Mavic Pro with little flying experience and capture the amazing shots with the High Definition Camera and it has sensors like ultrasonics which makes the drone more stable when hovering or when GPS isn’t available. The Mavic Pro is the only drone of its size to carry an integrated high precision 3-axis camera stabilization system, gives us a crystal clear photos and smooth videos, without losing a single pixel. The Mavic Pro is a Ready to Fly drone, and no installations are required. The only thing to do is to charge the battery. The flight time of this drone is 27 minutes. The Flight Autonomy technology used in the drone can see obstacles as far away as from 15m. So that it can fly at a speed up to 22mph while avoiding the things it sees. Mavic Pro gives good flight time and flies at great speed in the entire DJI series. The DJI Mavic Pro can fly for miles. The DJI’s uses the brand new OcuSync transmission technology, with a fly range of 7000meters and captures Full HD 1080p video streaming. It can fly upto 7km with obstacle sensing technology which is an added feature to DJI Mavic pro when compared to other DJI drones. Mavic Pro is a boon to photography lovers. The Mavic’s 12-megapixel camera with Adobe DNG RAW support is always ready to shoot just to take a snap or building up your portfolio. It fantastic image resolution will always entertain you with great picture quality. Place the DJI Mavic Pro away from the children. Never charge the battery in a flammable environment. Keep your hair, cloth and other accessories away from circulating rotors. If you want to fly within the city, It is mandatory to follow the FAA designated flight limit i.e. 400 feet. Don’t fly the drone in the crowded places. The UAV should be in our eyesight when you are flying it. Minimum age to operate this Mavic pro is above 13 and adult supervision is recommended. Never use the particular drone battery in any other drones. Follow the instructions from the user manual and enjoy the safe flying. This drone is amazingly small and portable and almost fit in your pocket. When it is folded up, the wings do not need to be removed. They fold as well. The centrifugal force will cause them to unfold when it is flown next. The top arms fold out, the bottom arms fold downward. The construction of the drone does not seem cheap or loose at all. The drone flies great right out of the box. I flew it indoors right away, and it never wavers. It goes up and stays in the correct position without using the GPS. First flight outside went very smooth as well. The controller is an upgrade from the phantom 4. It is smaller and less bulky. Video quality is very clear and stable even in the fairly stiff breeze. The controller has a digital display for all of the critical data. This makes it very nice because you can use your phone primarily for flying. Too pricey! Yuneec Breeze is just as portable, and the control panel is an app on your cell phone or tablet. This will not “fly” at this price point. On considering all these factors, I would say that the DJI Mavic is going to be the better choice because of its portability and the additional automated features it has and sets a new trend in the DJI series. You can even pre-order this DJI Mavic Pro drone from amazon from 2016 November. Amazon ships the unit during the first week of November, and you would receive your Mavic around the 10th of the November. Buy the Mavic PAmazonm amazon and enjoy the unbelievable flying experience.